Early in the 2012 presidential cycle, a friend and former staffer of Jeb Bush observed to me, bitterly, that this smart, capable man wasn’t included in the names of potential GOP nominees for only one reason: His name was Bush. I said that’s true, but it’s also true that he got his chance in politics because his name was Bush. He inherited the fame, the money lines and support, and made a career of them. There’s a rough justice in life, you have to roll with it. But public attitudes toward the Bush name have been changing. George H.W. Bush is increasingly acknowledged as a great diplomat, a patriot, a steady and sophisticated president, an exemplar of the greatest generation. When I say he should have won a Nobel Prize for his work in the days after the Soviet Union, and during the reunification of Germany, people are no longer startled and usually nod in agreement. George W. Bush, for his part, is the object of increased public affection, and it’s not just the paintings. Those who disagreed with him and opposed his decisions now readily concede his humor and warmth, his fortitude and the fact that you could count on him to stand on his word. As for the dynasty question, it would obviously be muted if Hillary Clinton gets in the race and is the Democratic nominee. We can still be depressed about that—dynasties are not like us—but the Democrats won’t be able to use it. The Republican establishment, such as it is, has the right to back Jeb if they think he can win. The grass-roots has the right to oppose him. Let it be a fight if he chooses it. 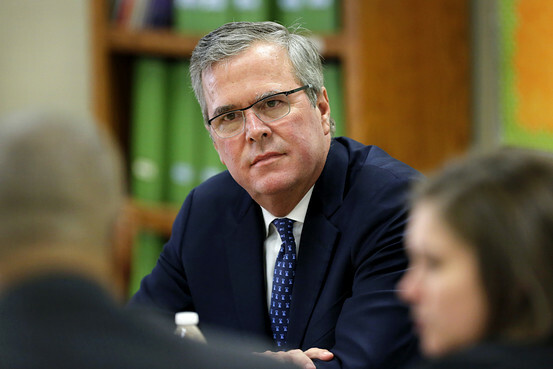 What is jelling into a cliché is true: Jeb Bush’s problem is not immigration per se. That issue is still dynamic; people are arguing and thinking it through. Jeb has an argument to make. When he told an interviewer last weekend that some illegal immigration can be seen as “an act of love,” I read of it and assumed it was an act of phony eloquence—insufficient, tin-eared, a sign that he’d grown rusty. But then I saw the interview. It was clear he was simply expressing a sincere respect for, and a kind of bond with, immigrants who have crossed the border to get the job that will feed the family. I thought of how I would experience his comments if I were here illegally or had a family member who was. I’d appreciate it, a lot. I’d hear what he said as a signal of empathy and understanding. I’d think he was saying “have a heart,” which is what Rick Perry said in 2012. And that’s not the worst thing a Republican could say right now, is it? Parenthetically I note that conversations with public-school teachers the past few years have reminded me how lucky I was, in high school in the 1960s, not to be surrounded by people who insisted I excel. They let us choose our own speed. I don’t remember being hounded by tests, which was lucky because I didn’t do my homework or test well. But I felt free to spend all my time reading good books and pondering things. I didn’t always attend school, but I did experience the joy of learning. The indifference of the educational establishment was a great gift to me. It allowed me to get an education. At any rate, there is surely a growing sense that if you want standards, you should establish them locally, with local groups fighting out whether more attention should be given to Thomas Jefferson than Samuel Gompers. No state wants stupid students. No parents want dumb kids. It will work itself out—awkwardly and imperfectly, like life. But back to Jeb Bush. I have no idea if he’s running, and neither perhaps does he. It would probably be a hard psychological question. He has seen the presidency up close and seen all the muck a family has to deal with on the way to the glory. That muck has only grown deeper since his father and brother ran. It would be surprising if he were not ambivalent about the enterprise. All his adult life his family has been in the spotlight: He knows the sting of undeserved criticism and the embarrassment of unearned praise. He knows what it is to see people you love attacked and not be able to answer because answering isn’t classy. Beyond that there is the father-brother thing, which is the foreign-policy question. His father is now seen as a foreign-policy realist. He was prudent after the end of the Soviet Union, he was tactful, and when he felt he had to go to war in Kuwait he built a world-wide coalition, did the job he said he would do, and stopped when that job was done. Jeb’s brother is associated with neoconservatism: Be daring, break the tectonic plates, force the realities to reconstitute themselves in new and better ways, invade, spread democracy. Where does Jeb stand? What philosophical assumptions guide his decisions? Whichever policy view he declares will seem like an implicit rebuke of someone he loves. Democrats are never forced to answer these questions because they are not expected to have a philosophy, only political exigencies. But Republicans are forced to answer, in debates run by a mainstream media looking for sport. And the question is more than a question about policy intellectuals and their preferences, it’s also a choice between the party’s suburban wing and its Born Fightin’ wing. It will all be complicated. But if you really want the presidency, you accept the complications. You can’t run ambivalently. Mr. Bush knows this, of course, which is why he talks about only running if he feels the joy of it.